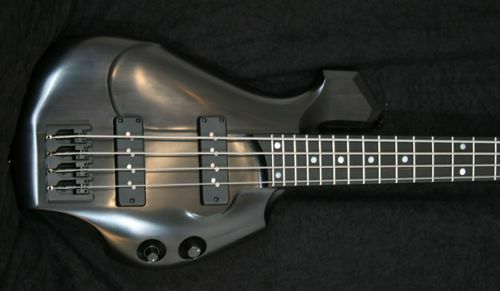 The original Padilla bass design was the result of a collaborative effort between builder Jerome Little of Little Guitar Works and bassist Xavier Padilla. Developed over the course of 6-8 months, the bass was designed to help alleviate Padilla’s battle with deQuervain’s Tenosynovitis – a form of tendinitis and Repetitive Strain Injury (RSI). This particular Padilla style bass retains the original’s focus while taking a more streamlined approach to construction. For example, Jerome Little redesigned the headstock for regularly mounted tuners (vertical string posts instead of the original horizontal posts) while retaining the original open center headstock. The bridge is now surface mounted compared to the original’s arrangement. The full length thumb rest is gone. But the resulting bass is no less unique. A number of elements contribute to ergonomics. At 7.5 lbs, it’s not only lighter than most basses but most guitars. A cutaway in the body allows it to be played in classical position. But the big standout is the Torzal neck which reduces wrist flexion (bending) through its -20 degree twist at the nut and +15 degree twist at the bridge. The result is a reduction in stress and strain on the tendons and nerves that pass through the already tight passages in the wrist. To see how the original Padilla bass in action, check out this Xavier Padilla solo from a Gipsy Kings performance. For an in depth look at the Torzal neck’s features and advantages, tune into this Bass Guitar Magazine Review. Hi! I am Burcin from Turkey! This bass body its very nice. Curves, lines, volume and tone knobs is very ergonomic designed. Congratulations for this Bass Guitar! Excellent! I’m always a fan of small bodies â€” add the other features and the result is ergonomic and stylistic goodness. Another beautiful piece from Little Guitar Works. I’d like to see it headless and fretless. I wonder what fretless would be like with the Torzal twist? That would be interesting, Al! I wonder how it would feel. I like headless instruments but some folks find it throws them not to have a headstock. I wonder if the combination of the Torzal neck and a headless design might be a bit daunting for some – at least initially. A stub headstock could help – something like seen in this Scott French travel guitar. Fretless “fanned-frets” is something I’ve been thinking about quite a bit. 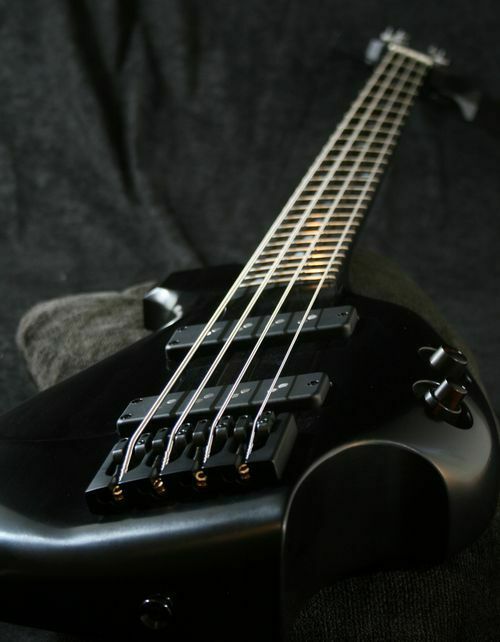 It would combine the tonal benefits of compensated scale lengths with a fretless sound. Lovely, I’d imagine. But it would require immense skill to play due to the logarithmic progression. Does anyone think it would be possible to learn? I’m just starting on a headless Torzal commission now. I’ll be happy to give a report and share pictures when it’s done. I have done the fretless twist but not yet the fanned fretless, although I have had more than one client give it serious consideration. I think sound and comfort wise it would be lovely–if it were me I think I would need lines in the board to help me out for awhile! Thanks for the post, Robert, and thanks for the comments. Very exciting, Jerome! And please let me know how you come along with the headless Torzal. Headless is definitely a little strange at first and I’m guessing a challenge to the builder, as it changes the balance of the instrument. After a short while, I found it quite liberating and love being able to tune from the body. This looks like a truly awesome bass and making it headless would only make it better, in my biased opinion. Headless AND fretless? Al, I like the way you think. Very nice instrument! I am completely sold on the concept of the Torzal twist, not only for the longer scale bass, but also for guitars. I do see why it hasn’t caught on as much though for guitars since it is more common to bend strings. Since Jerome is on the thread, do you have any comments on the topic? I can’t for example see that the Lace Helix guitars offer a twisted neck any more. I would like to see a Torzal guitar with a Tremologic (http://www.playtremologic.com/) to see if there is a way to come up with a new playing style that works. FWIW I am also sold on the topic of headless instruments and do what I can to contribute to that market. Xuse me for weighin in a bit late. Wondered if … well, combining all ergonomics? Trapezoidal neck AND Torzal, trapetorzoidal? 🙂 Rick Toones cunning neck profile? 2. They cause MY thumb (not someone elses) to bend a bit TOO awkwardly behind the neck and press unneccessary to countermeasure the neck from the fingers pressing the frets. Especially when playing the first frets, and mostly on bass. Causing pain and the joint insided the thumb to hurt occasionally. DeQuervains syndrome maybe. I don’t know. This has occured recently. 1. Take ANY HEADSTOCKED instrument. Light or heavy, Les Paul or acoustic, sit down and play. Now, just TRY to not use any thumb behind the neck at all times when try to play and fret normally. See how the neck moves towards you all of the time when pressing the frets? No? 2. Try the same on HEADLESS neck. Notice the difference? It’s more easy to produce this wiggling thing with the neck on headless than on headstocked. It has a stronger LEVER principle causing it to bounce about! This causes me – and others – to miss certain strings, and whole chords, during intense playing, especially when switching fast between up and down the neck (and I do). Thus, a bit more force is then needed by the thumb on the back of the neck. Totally unnecessary from an ergonomic and R.S.I. standpoint if you’d ask me. This is – of course – due to that our fretting hand thumb has been learned to just produce that much amount of pressure to be able to hold any headstocked neck in place when playing. We’ve learned our trade on those since we where kids. So when suddenly go over to headless we need to readjust the thumbs pressure. And the thumb just needs – or should need – to press as light as possible and just be used as a guide. Not going the other way, pressing harder just because we should make it keep still. The thumb should point straight up and not arc in any way. I HAVE to arc mine on headless sometimed when reaching for the first frets, not on headstocked though. I took out my heavy, chunky strat with classical width neck, and started to play WITHOUT USING MY THUMB at all. It worked! It doesn’t wiggle. I can’t play fast though and barre chords are out of the question. Which still reminds me of fastening the guitar to an upright guitar stand, so it does not move at all. Or, more cunningly, have a sort of HARD TOP STRAP made that fixes the guitar (any, headless or headstocked) to the body so it does not move about IN ANY WAY. I know, it would be a real trick to make that fit different persons but anyway. Take notice, that the movement of the neck in our out is within 0.5 cm or less than a quarter of an inch. It is especially noticeable when using tapping techniques. But this headless “wiggle” is starting to show itself the most from medium to high speed playing/tapping. I do think – and I have tried this – that a headstock COULD BE USED to counterbalance this LEVER principle. Although it can’t be so heavy it makes the neck dive. Then it’s totally counterproductive and goes the opposite direction. You don’t even need to play. Just “whack lightly” with your fingers on the fretboard and discover how little force is needed to make the neck move inwards by a great deal. Do the same on headstocked instrument. You have to use a much greater force with your fingers in order for the neck to move towards you. Considerably more than fretting any of the strings. So for now, I’ve resorted to headstocked strat again, in order for my thumb to heal. When I am using the thumb, it doesn’t hurt because I don’t press it so hard on headstocked instruments. If the Torzal or Ricks Trapezoidal necks remedies this I don’t know. Verdict: This must be adressed on headless instruments.